To be honest I had only learned of the Space Camp Hall of Fame sort of by accident in 2012. 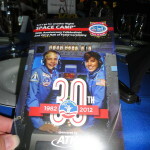 It was the 30th Anniversary of Space Camp and they sent out a request for Space Camp alums to come and take part in the celebration. They wanted to have 1 representative from each year. The dinner just so happened to coincide with our cross country, from Houston to Annapolis, move and Huntsville, AL wasn’t too terribly far out of the way so we decided to swing through. As I was reading up on the event I found out that not only was there a Space Camp Hall of Fame but I had some friends being inducted! I was even more psyched to be able to attend the event! The event was fantastic and they did indeed have alums from every single of the 30 years there to represent. (I was proud to carry the sign for 1994.) I was so excited to be there to see Liz & Ed be inducted into the Hall of Fame as well as Hoot! All are such amazing individuals who have done so much in the space industry. I feel lucky to have worked with them and to call them friends. I was just sad that I didn’t have more time to spend there touring about since we did need to get back on the road to head to Annapolis. I hoped I could get back for a visit in the not too distant future. Fast forward to the following summer… I was in Florida with 2 students (Ari & Sarah) who I was touring about for an ISSET Space Center Experience. (Yep they got the grande deluxe tour since it was just the 3 of us in Florida!) So there I was… with these 2 incredible young ladies who were inspiring to me with their thirst for knowledge and their passion for space, when my phone rang. It was Space Camp calling to tell me that I had been selected for the latest class of the Space Camp Hall of Fame. I was completely shocked and surprised! I didn’t expect that at all! It was so apropos that I found out while I had some students with me. It makes the memory of being notified that much sweeter!